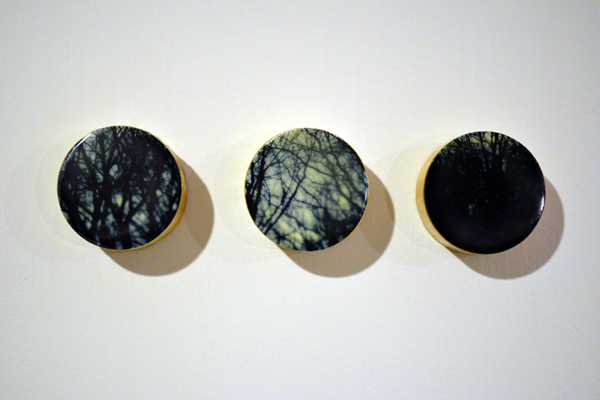 Forest for the Trees #16, Photo Encaustic on Poplar, 2013. Throughout my work there is a theme of longing through conceptual gesture. I make images that hold a sense of poetry or reflect on the complexities of the human experience. Sometimes I create spaces or interactions, like in my installation work or community performance. Usually a lens is involved in some way, because of my history with photography, but not always. I use computer technology, but my work does not look “digital”- rather the technology is a means to an end, a tool. The work falls into a broad range of categories – photography, drawing, painting, mixed media, intermedia, depending on what framework you want to put around the artwork. I am heading into my 39th year. I grew up in Portland Oregon before Portland was hip and trendy, on the working class side of town. The public transit system opened worlds for me. I got on a bus pass at 14 and rode around town exploring places I had never been, literally expanding my own future. That sense of the landscape seen through a bus window, seeing everything I can in the world, is still part of my practice. This is one of many formative experiences from my hometown. Since moving to the Midwest I have explored interests in personal memory, landscape, cinema and a sense of place. Science has always appealed to me, but I am far too subjective to withstand the rigors of its objectivity. At twenty, when my father was diagnosed with cancer, he gave me a camera. This had a large impact on me, and I became very fond of how the lens can frame, reconfigure and interpret the everyday world. 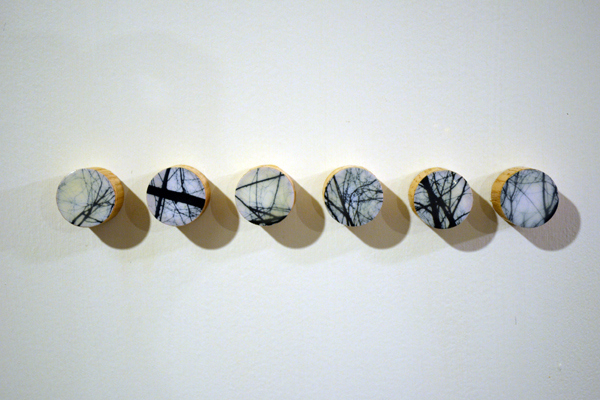 Forest for the Trees # 15, Photo Encaustic on Poplar, 2013. I have a “traditional” studio, we converted one of the bays of our two bay garage into my studio space. During the school year I only get to spend a couple of hours a week in that space. That studio is one of the spaces where I can complete my ideas, or leave a work in progress over time. One other studio space is my kitchen, where I have my computer most of the time. Since I have several different roles (mother, middle school teacher, adjunct professor, artist) I am often balancing these different tasks in the kitchen. I like to cook from scratch, so while I am making bread dough or cooking a soup I am also researching ideas, writing proposals for a show or grants, grading lessons plans, or working on digital editing, all while cooking meals. My last studio space would be my middle school. We have a very large school campus and I sponsor our garden club. We have 17 raised beds in our vegetable garden and a very large perennial garden of native plants. Except in the coldest months of winter I try to spend some time every day walking and being in these places, which helps me think. My framework of success has radically changed since when I first started making art. If you would have asked me at 24 if I would be an artist who was also a middle school teacher, I would have laughed and said you were insane. At the time I was very much indoctrinated into the concept of artistic success proselytized at private art schools and in MFA programs. I made moderate regional success with my work fairly early in my career. 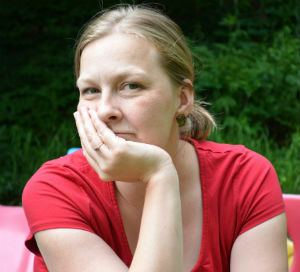 I continued on that path Between until 2009, struggling to balance my roles as a mother, adjunct professor and artist. My husband and I were collaborating on large scale installations, he was on the tenure track and I was an adjunct at three different Universities. In 2008 we were mentioned briefly in an article in Art in America. This should have been a pinnacle moment of success in my career. Instead I felt deeply dissatisfied with what I was doing. Simultaneously I was working during the day as a grant maker at a private foundation. One of the things I had the experience of watching was an enormous amount of money being paid for public art projects being done by “Big Time” artists. The foundation would pay a large sum for piece of art with an art star name thinking that this would transform a place. To me, placing very expensive artworks in a community seemed to benefit the artist and their pocketbook more than anyone else. I felt very uncomfortable with all the worlds I was living in. I wasn’t really sure about what I was doing, or why I was working toward goals I did not believe in. In my heart I believed that the arts could have the most impact on people when they have the chance for authentic and personal experiences with creative production. All this resulted in a life changing realization that I needed to change my framework of meaning and success. I realized my real interests where in the intersections of studio practice and arts education. So I went back to school, got my K-12 teaching license and now teach in a middle school. I am fostering future artists every day, helping them explore creativity and the creative process. My life now is very much focused on balancing the needs of my children, my students and my own artistic pursuits within the frameworks of success that I define as important and rewarding. I adore my middle school students and focusing my energies on making an impact in these arenas, instead of trying for success in a money driven art world. As an artist who is balancing the needs of two children and the daytime needs middle school a circus of multitasking. During the week studio time is interspersed with other activities, driving to work, walking during my lunch time, playing at the park with my children. I always have some type of camera with me, and I gather images that I will play with later. Then the weekends are when I get into the “traditional” studio. 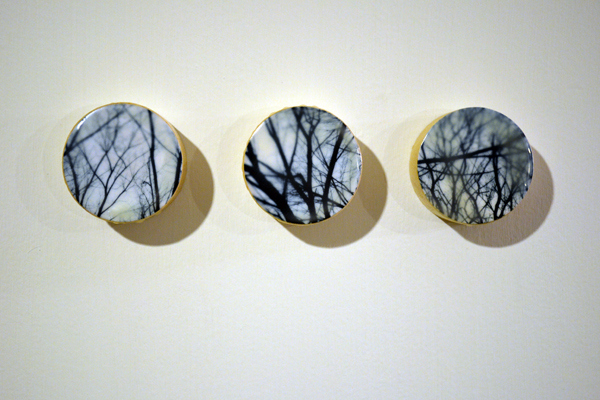 Forest for the Trees # 14, Photo Encaustic on Poplar, 2013. 5 years ago my husband and I were exhibiting elaborate installations throughout the Midwest. Since that time my work as moved towards being more intimate and personal, conceptually and literally. I see the work of teaching during the day as informing my studio practice, in my modes of exploration. I find that I am making less work but the work is more personally meaningful. My husband, Russ Nordman ( www.russnordman.com ), has the greatest impact on my work. He is my biggest advocate and supporter. Early in my development the teacher and photographer Heidi Kirkpatrick ( www.heidikirkpatrick.com ) was extremely impactful on me, and I always think of her when I think of who has had a great impact on my life. Lastly I am most inspired by artists who are making a life for themselves in unique ways, that list is too long to put here, but I admire and am inspired by those who are finding their own voices and creating their own frameworks of success. I would like to be a farmer. I absolutely love to dig in the dirt and grow things. I adore being outside and physical work. I find real joy in growing something from seed. One of my long term goals is to buy 3 to 10 acres and develop a hobby farm / artist retreat once I retire from teaching, but that is many, many years away. Right now I think I am doing exactly what I was meant to do. Jody Boyer is a visual artist and arts educator originally from Portland, Oregon. In her studio practice she explores the broad interdisciplinary possibilities of traditional and new media with a specific interest in personal memory, cinema, landscape and a sense of place. She received her B.A. 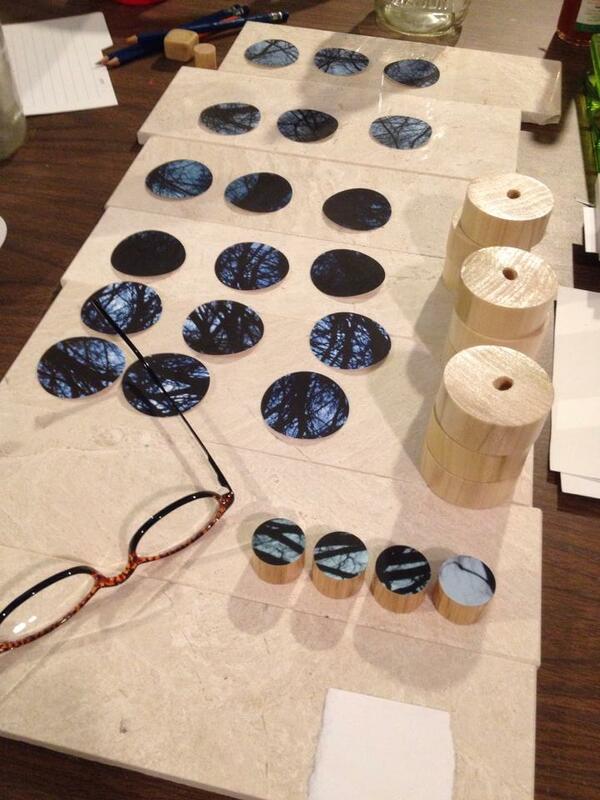 in Studio Arts from Reed College, her M.A. inIntermedia and Video Art from the University of Iowa, and her K-12 teaching certificate at the University of Nebraska at Omaha. Her artwork has been shown nationally, including at the Des Moines Art Center, Womanmade Gallery in Chicago, and the Bemis Center for Contemporary Arts and in such publications as Review and Art in America. She has taught in a variety of P-16 environments including Universities, public schools and community nonprofits throughout the Midwest. She currently teaches art education and digital media courses at the University of Nebraska at Omaha and visual arts at Norris Middle School. In 2014 she was selected Nebraska Middle School Art Educator of the year by the Nebraska Art Teachers Association. This entry was posted in Encaustic, Photography and tagged Art Teacher, Iowa, Omaha, photography, Portland. Bookmark the permalink.